Frontline Logistics container management program ensures the proper recycling and handling of emptied industrial packaging. Don’t let your old containers sit around gathering dust, recycle them! This program is good for the environment and great for product costs. Our return system is one of the most user-friendly return programs available in the industry! Read the rules and regulations in the "IBC Return Program" link below, complete the form and either fax or email it to us. Make three (3) copies of the Bill of Lading, sign them and give two (2) copies to the driver when your industrial packaging is being picked up. Industrial packaging will be picked up within 10 business days upon receipt of the Bill of Lading. Click on the link for the “IBC Return Program” form below to download a copy of the activation form. To begin the pickup process, complete the form and then either fax it to (734) 449-9596 or e-mail to dispatch@frontlinelogistics.com. How easy is it to process a return? Very! Simply fill out the easy to use form and send it to Frontline Logistics. We'll set up the transportation and send you a completed Bill of Lading. Sign the Bill of Lading and put it with the IBCs and/or drums. When will my containers be picked up? Containers are generally picked up within 10 business days from the time the Bill of Lading is sent to you. Do I need to use the supplied Bill of Lading? Yes, the supplied Bill of Lading contains proper invoicing and consignee information. The supplied Bill of Lading lists the only approved trucking company that is assigned by Frontline Logistics' personnel to pick up the IBCs and/or drums. Unauthorized trucking costs will be refused and charged back to the shipper. Is there a minimum number of containers required for pickup? Yes. 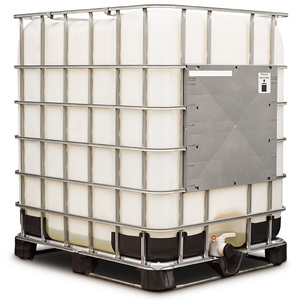 Generally, the minimum for any pick up is six (6) IBCs and twenty (20) drums. Can I return IBCs other than Frontline Logistics' Passport IBC? Yes, we accept all IBCs. Does the IBC have to be empty before I return it? Yes. All returns must be drip-dry empty, granule-free and free of any solidified residue on the interior and exterior of the IBC. Excessive heel will be billed back to the shipper at $10.00 per gallon for non-hazardous material and $15.00 per gallon for hazardous material. Do I need to provide MSDS documents? In most instances, you do need to provide a MSDS. Product Material Safety Data Sheets are kept on file at Frontline Logistics as provided by the filler of the Passport IBC. There are some cases where a product MSDS is not on file and you will need to fax the MSDS to Frontline Logistics to activate the return. Do I need to supply placards for the carrier picking up my return? Yes, placards must be provided by the emptier if the emptier is returning a lading that is hazardous. Non-hazardous material does not require placards. Is the program free everywhere in North America? Passport IBC returns in the continental United States & Canada will be collected free of charge as long as the minimum quantity of IBC's and/or drums is met. In Canada, there is a surcharge of $10.00 per IBC for collections in Alberta, British Columbia and Newfoundland. There are no collections in the Northwest Territories, Yukon or Labrador. Contact us today to schedule an IBC container pickup or to learn more about recycling your old totes.